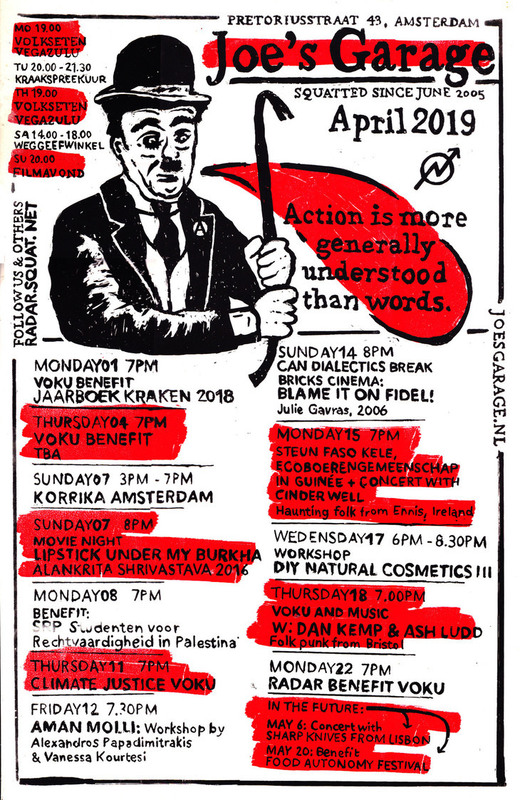 Despite the continuous efforts by the government to keep squatted spaces under the threat of repression and eviction, new autonomous and creative projects keep on emerging in Amsterdam. 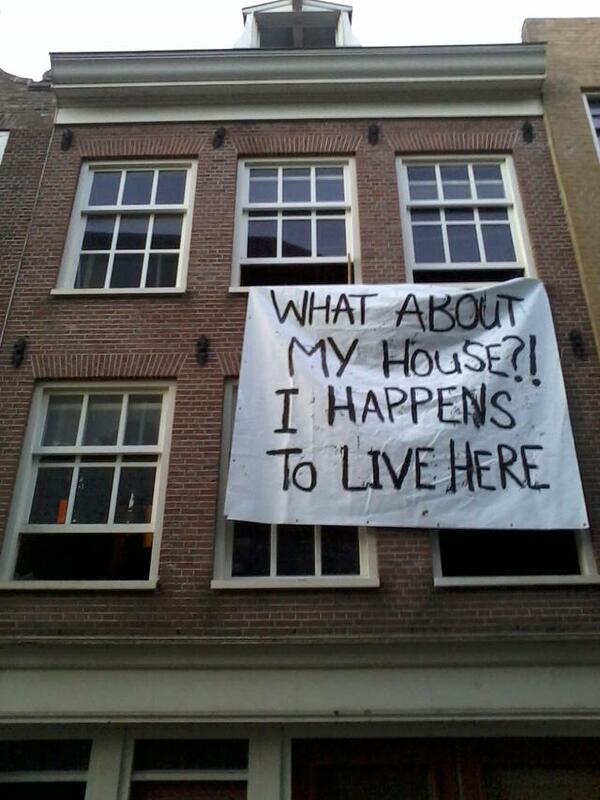 On March the 1st, the buildings on the Vechtstraat 1, 5, 7 were squatted. 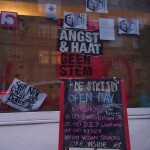 A new social centre, De Strijd, on Vechtstraat 7, opened just two weeks after the occupation. The ongoing workshops (language classes, martial arts), vegan kitchen, and give away shop immediately transformed these buildings from objects of real estate speculation into spaces for the experimentation of radical politics. The support of the neighbours and the large participation of many groups of activists show the vital importance of creating autonomous and collective sites of struggle to contrast the political desertification of the city. 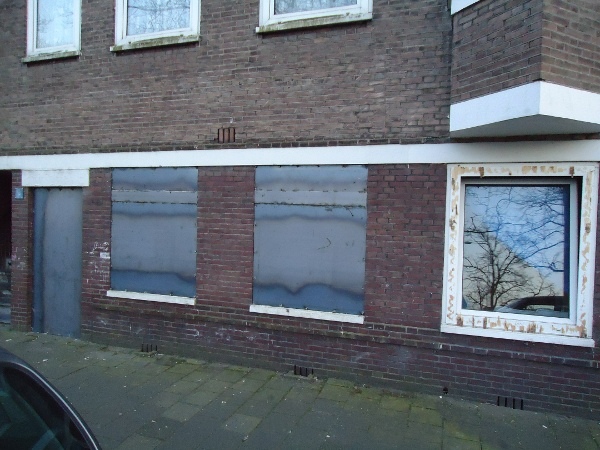 One week after the occupation of the Vechtstraat, another building of the same block got occupied, on Amstelkade 25. Both the Vechtrstraat and the Amstelkade 25 were owned until recently by Wim Oostveen, known speculant and politican who is in the process of selling the block to yet another speculant: Sjoerd Peereboom. Local politician Paul Slettenhaar was quick to stereotype the new habitants of the neighborhood but unfortunaterly, the boomerang was in no time back in his face. 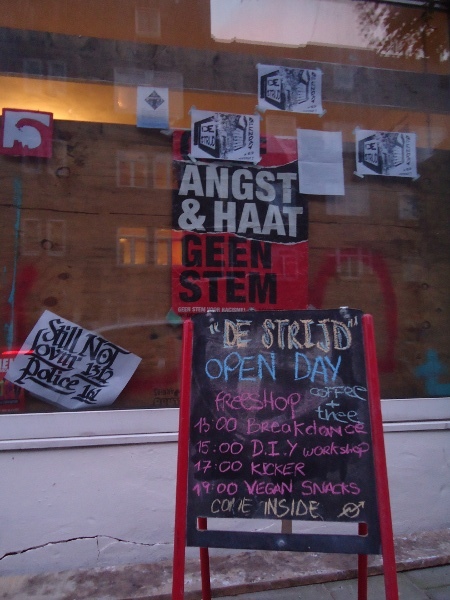 Sloterdijkstraat 4 has been resquatted on March 9th but it was soon speed-evicted by regular cops on March the 28th: the reason of speed-eviction, according to the cops, is that the owner, R.R. Cauveren, is trying to sell the property. The building was squatted for the first time on November 22nd, 2008. In January 2011 the squatters won a court case against the owner, who could not provide evidences of making use of the property. 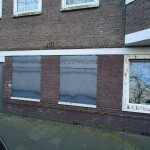 Yet, at the end of 2011, the squatters were evicted, and since then the building remained empty. Considering the history of the building and the attitude of the owner, we can assume that once again the building will remain in disuse. This is just another example of the absurdity of the squatting ban, which keeps on allowing the police to evict people from their homes and to blindly protect real estate owner’s rights. On March 21st, Grasweg 51 was squatted and directly turned into use by a group of students who want to create an alternative cultural centre and living space. 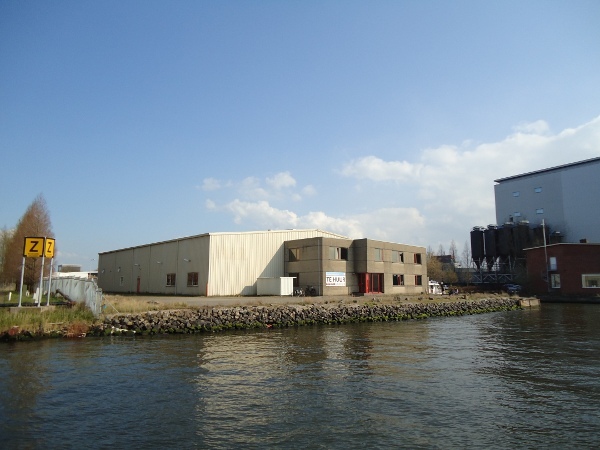 Located in Amsterdam North, across from the Silo, the building is a huge hangar to rent for only € 14.000 a month, five minutes biking from the Overhoeks Towers, in a neighborhood your won’t recognize within 10 years, where ground speculation knows no limits. On March 23rd, the Sumatraplantsoen 70hs was squatted. As the adjacent recent squats 66 ground floor and 68 I & II, it is owned by the housing corporation Eigen Haard. 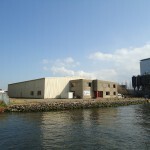 The owner Eigen Haard with the help of SEON was quick to seal the next ground floor, that was remaining empty, with metal plates welded to provide practice to the breaking crews in town and free barricading material. Although the local residents are organising protests against the massive project gentrifying the neighbourhood, this does not prevent Eigen Haard from kicking out low income tenants, and leaving large number of houses empty. In this context squatting these houses expresses both a protest and a solution to the increasing shortage of affordable living spaces. Zeeburgerpad 22 went to court on March 26th. Not the owner but AK Beheer, the anti-squat company, started a civile procedure against the squatters. No verdict yet. 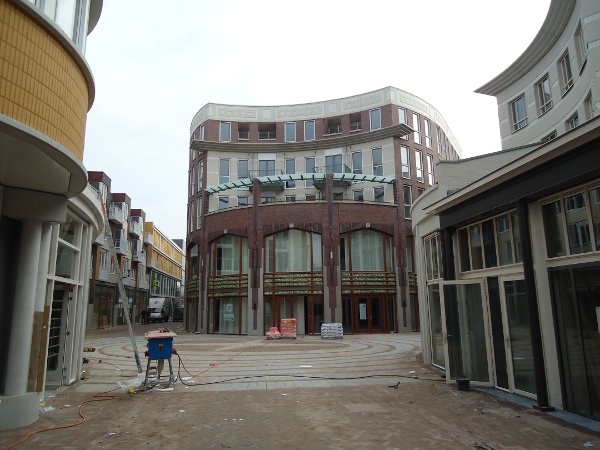 The office building on the Ellermanstraat 33 is back to the owner. The speed eviction never came as squatters were threatening to challenge the state in court. Instead, they got their 8 weeks notice eviction and that was the end around March 24th. On March 30th, the Swamp on Sumatrastraat 232, squatted on December 15th, was taken back by the owner. Eigen Haard immediately gave the space to an anti squatter who will not use it as a house but as a temporary atelier. 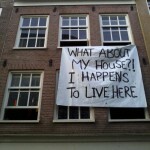 The three squatted appartements on Tweede Oosterparkstraat 39hs, 43hs, en 45hs were supposed to go to court on March 31st, a procedure started by the new owner, OP2 BV. The number 43hs gave up the fight after 12 years on March 28th. The other two are squatted since May 2011. After 10 years of doing nothing, Stadgenoot decided to get rid of the houses. Families with a temporary contract (anti-squat) had been living there for ages before they got offer new housing by Stadgenoot. The Valreep has been campaigning these last months under the moto “Valreep for ever”. A fake list pro Valreep, Lijst 620 was running for the local elections and put back Valreep into the political debate. The city was covered with subvertised posters from political parties, with pro Valreep statements. On March 20th, a convoy of city officials and potential buyers visited the Valreep. A welcome committe took them for a memorable tour. 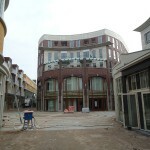 In the meantime, bulldozers are moving closer on the Oosport and a new shopping street with 45 new shops opened end of March with loads of fanfare. City planing at its worst! Think of Almere. Other shops in the neighborhood may soon have to close down bringing a lot of emptiness with it. 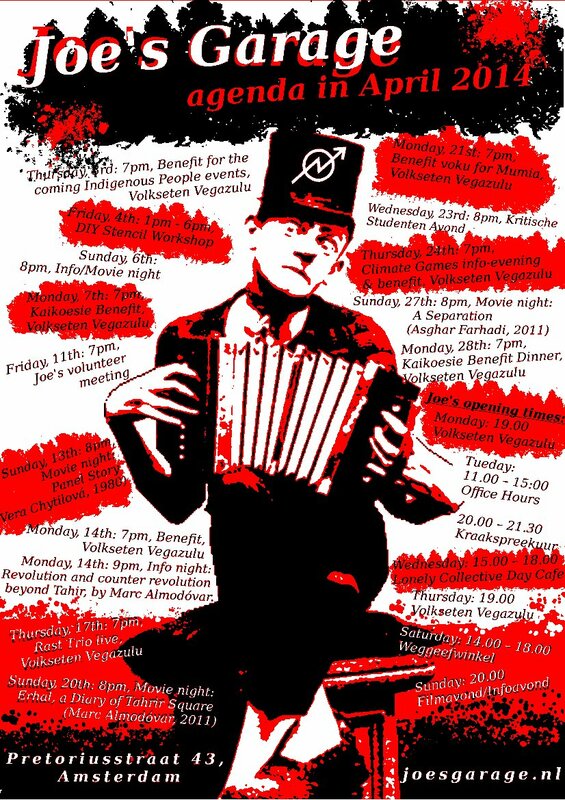 In 2012 the mayor declared that the battle against squatting was won by the government. According to the city council, the ‘problem of squatting’ was solved with 330 spaces evicted in two years : in the face of these repressive discourses and practices, squatters keep on showing that squatting is still possible, it is still joyful, and it still functions as an important struggle both for housing and for radical politics. The housing coop Soweto is collecting obligations, donations to start its first housing project in Amsterdam. In order to buy the old school building on the Pieter Nieuwlandstraat 93-95, Soweto is seeking for your financial contributions, lot of people already participated but Soweto will need more to achieve their goal. Joe’s Garage has been existing since 2005. All the people that crossed its doors contributed in keeping the space alive and in shaping the project in different directions. 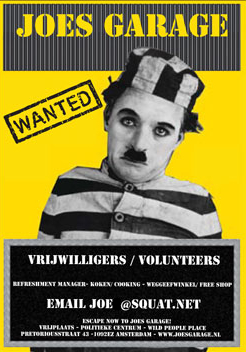 Of course, the space is always open to new volunteers and to different contributions. On Friday April 11th, at 7pm, there will be an open meeting for volunteers: all those who are supporting the project are welcome to come to meet each other and to think together about how we would like to participate further, to discuss opinions and critiques, and to share nice food. Come along! Among the regular agenda, this month Joe’s Garage will host many events, movie nights, and benefits. Check the program online, import our iCal feed. Check our previous news pages.